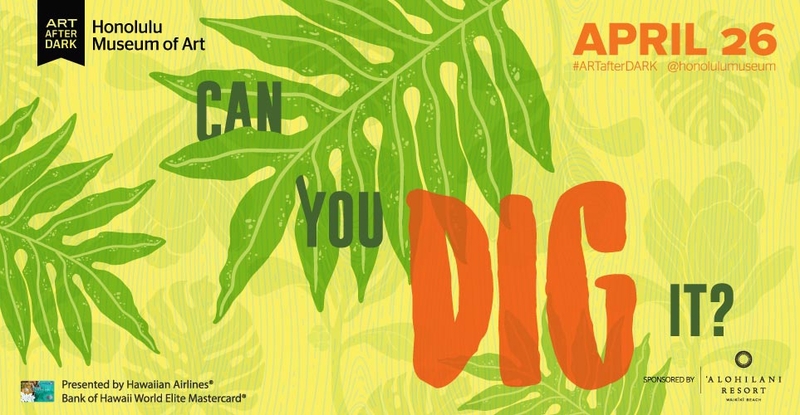 Honolulu Museum of Art » Can You Dig It? Home / Events / ARTafterDARK / Can You Dig It? Purchase or renew your HoMA membership with your Hawaiian Airlines® Bank of Hawaii World Elite Mastercard® and get a free ARTafterDARK guest pass. Get here early! Some galleries close at 8pm. Doors could also close as early at 8pm if we reach capacity. No guest entry after 8:30pm. ARTafterDARK Presenting Sponsor Hawaiian Airlines® Bank of Hawaii World Elite Mastercard® will champion ocean ecology with a special installation by New York/Hawaiʻi artist Maikaʻi Tubbs in Mediterranean Courtyard. Receive a complimentary sample of reef-safe sunscreen and lip balm, supplied by Hawaiian Airlines partner Raw Elements to encourage protection of our oceans and sea life. Limited supply is available. Visit the Tree-inspired photo area Palm Courtyard and stay for a performance by a Living Tree Goddess from Iona Contemporary Dance Theater. Enter to win an ‘Alohilani Resort Waikiki Beach stay package to include a VIP cabana and visit to Gun Stock Ranch for a tree planting excursion (Restrictions apply, please check with ‘Alohilani Resort for details). RE-LEI, a group of local landscape architects and design professionals, will be showcasing unconventional lei made from recycled materials. Winning lei from the RE-LEI contest will also be on display. Dj KK (DJ Keala Kennelly) will take the Central Courtyard stage in the with her signature mix of tropical “feel good” house, tech and indie house, and nu disco froom 6-8pm. The Hydrolites will keep the good vibes going after 8pm in Central Courtyard with roots, rock, and reggae. See Magnum Globeus Opus, an eco-conscious film by creative agency Vision District. Docents will be present to in the Lisa Reihana: Emissaries, Honolulu Biennial 2019 at HoMA, and Hayv Kahraman: Superfluous Bodies exhibitions, as well as the newly-installed Melissa Chimera: Migrant exhibition. Beer, wine, and a specialty cocktail recipe from ‘Alohilani Resort Waikiki Beach—The Treetini, made with Ocean Vodka, honey, lemon, matcha, and prosecco by Free Spirits Mobile Bartenders. While we encourage everyone to have a good time, we ask you to remember WE ARE A MUSEUM with priceless works of art. Please respect our facility and our rules. No large bags, tobacco products/vaping, illegal drugs, outside food or alcohol allowed. Please do not bring food or drinks into the galleries and DO NOT TOUCH THE ART.